You know how it is when a particular dish is on your list. You know the list. For me, the list is a constantly growing mental catalog of food ideas I see in cookbooks, magazines, blogs, etc. Once something is on that list, I seem to be reminded of it at every turn. But, if the dish is a little bit complicated or requires specific, seasonal ingredients, I put it off until the time is right. 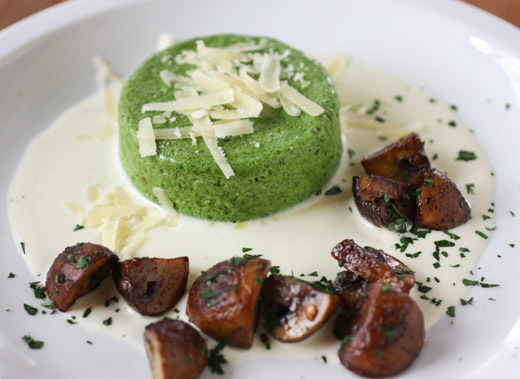 One such dish was the Fluffy Spinach Bites with Fonduta Sauce from Happy in the Kitchen by Michel Richard. It’s a stunning dish. 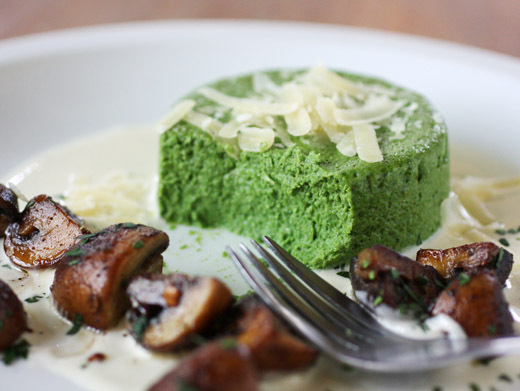 A spinach souffle is baked in a square pan, and then perfect cubes of it are cut for serving. Those cubes of souffle are served with a parmesan fonduta. It’s lovely, but it involves cooking spinach, steaming parsnips, pureeing those with cream and eggs, some gelatin is used to help it set, the souffle is chilled after cooking so those nice cubes can be cut, and then the cubes are re-heated and the cream sauce is made. I did not make this beautiful thing that had been on my list for a few years. Instead, I saw something very similar but simpler in The Vegetarian Option by Simon Hopkinson, and I chose the easier option. That version was a mousse of pureed, cooked greens, eggs, and cream cooked in individual ramekins, and each serving was plated with a pool of parmesan cream sauce. When I saw how similar this was to the dish on my list and how much more streamlined making this one would be, it had to happen. In the book, this is called Spinach Mousse, but I had some gorgeous, fresh collard greens from my CSA and used them instead of spinach. Any greens would work here. You just blanch the chopped greens, drain them, and then squeeze them in a kitchen towel to remove as much water as you can. 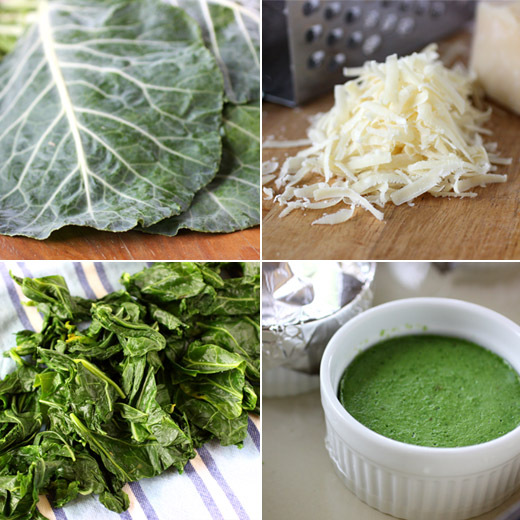 The squeezed, cooked greens were then placed in a blender with eggs, cream, salt and pepper, and a pinch of freshly grated nutmeg, and the mixture was pureed. Ramekins were buttered and lined with rounds of parchment paper and then filled with the puree. Each ramekin was covered with foil, placed in a roasting pan, and then hot water was added to the pan before baking. You’ll need to check the texture of the mousse after about 20 minutes. The cooking time will depend on the size of the ramekins used. For me, it took about 30 minutes for the mousse to become set and firm. Making the parmesan cream is a simple matter of heating cream, adding shredded parmesan, stirring until it melts and then simmering until the sauce is as thick as you’d like it to be. And, of course, season the sauce with salt and pepper to taste. I felt like the plate needed one more color, so I sauteed some mushrooms to scatter on top of the parmesan cream sauce. This version was so easy, and the mousse held its shape so well, I’m now going to have to try baking the mousse in a square pan and cutting it into cubes. More importantly, I would definitely try this again because it was a fabulous way to eat your greens. It’s a little rich, but it’s also nice to see such humble greens turned into a decadent, silky mousse gilded with that luscious parmesan cream. Now, I need to get to all those other dishes on my list. UPDATE: Instead of choosing one winner, I'll now be choosing five winners to each receive a copy of this book. Barry Estabrook very kindly offered to send a few more copies, and I'm happy to be able to pick more winners. Why are we celebrating? Because it's March. This blog was born in the month of March four short years ago, and I too was born in the month of March, um, we'll just say a few years prior to that. So for the blog birthday and my birthday, I have a gift for you. 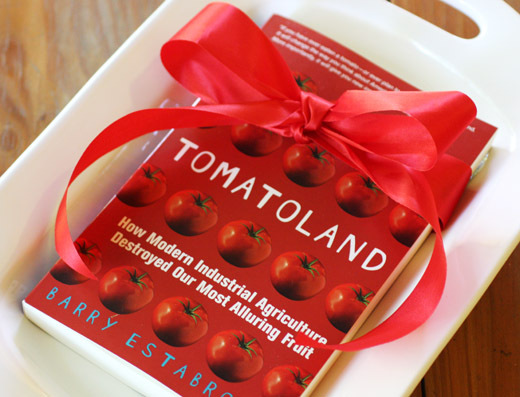 I received a review copy of the book Tomatoland by Barry Estabrook in paperback. The paperback version will be released in April. Since I also have the hardcover version which I read last year and then recommended to everyone, I want to share this new paperback with you. Tomatoland is about the problems with the tomato industry and the true cost of the way tomatoes are currently grown. It's enlightening and at some points shocking, and it delivers a bit of good news at the end. Of course, I think everyone should read it. Just leave a comment with your email so I can contact you if you win. I'll pick five winners on Wednesday, April fourth at noon CST. The winners will each need to provide a mailing address in the US after being contacted. Good luck, and happy March! Even though I wasn’t exactly sure of what this recipe would produce, I completely trusted that it would be good. 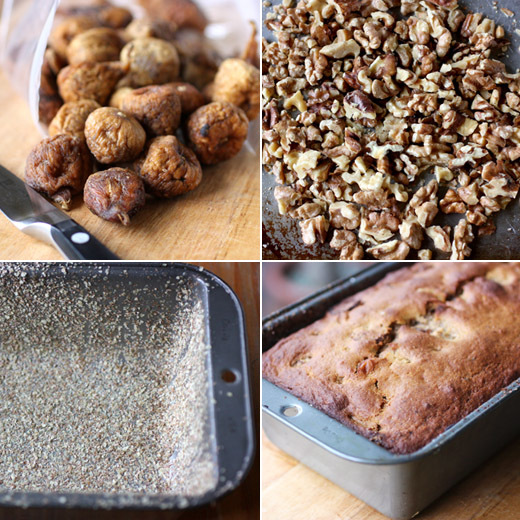 I wasn’t sure if it was going to be like a pound cake or more like a loaf of chewy raisin bread, but since Maida Heatter said it is “old-fashioned and kind-of-healthy-tasting… this is wonderful as a coffee cake” I wanted to try it. It’s from Maida Heatter's Cakes , and if Maida has included a recipe in one of her books, you know it’s well-tested and worth making. 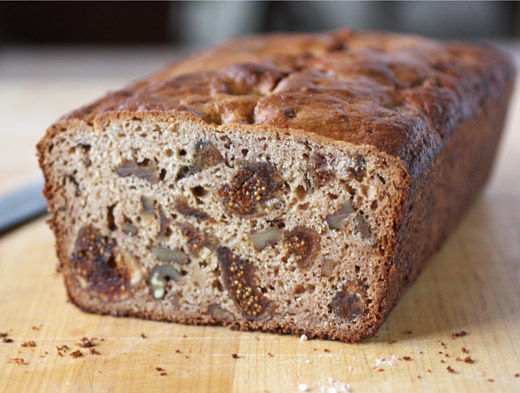 This fig bread is made with dried figs, of course, white and whole wheat flour, honey, buttermilk, just a half a stick of butter, and some walnuts. There’s no refined sugar or eggs, and that’s what caused my uncertainty about it. When I cut a slice of the bread, I discovered it was sweet from the honey and figs, but not too sweet, and tasted more decadent than expected for a whole wheat loaf. Maida suggests serving the fig bread plain or toasted, which she notes is “super,” or with butter, cheese, honey, or marmalade. I agree that it is super toasted and enjoyed it on its own with either no other adornment or just a thin coating of butter. There’s always something interesting in Maida’s instructions. Here, to prepare the loaf pan, she recommends buttering the pan and then dusting it with wheat germ for a brown crust, oatmeal for a chewy crust, or dry bread crumbs. I went with wheat germ, and the crust was nicely browned. To start the bread, white flour, salt, baking powder, and baking soda were combined, and whole wheat flour was added and mixed to combine. Dried figs that had been stemmed and chopped were tossed in the dry ingredients to coat. In a separate bowl, honey, buttermilk, and melted butter were mixed, and toasted, chopped walnuts were added. The wet ingredients were folded into the dry ingredients, the batter was poured into the wheat germ-dusted pan, and it baked for about an hour. 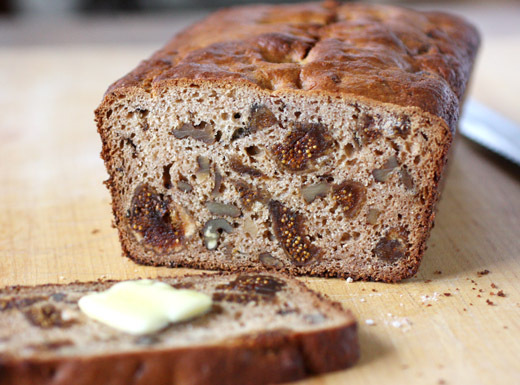 As a reward for trusting the recipe, I got a fruit- and nut-filled bread that was perfect for breakfast. It wasn’t too rich or heavy, and it packed enough flavor of its own that toppings weren’t even necessary. It’s rare that I dive into a recipe without a pretty good idea of the outcome, but in this case, I knew I wouldn’t be disappointed. Shucking oysters had been on my list of cooking-related things I wanted to learn or attempt. Of course, I'd seen it done many times. Still, I was sure that unless someone stood there and showed me exactly what to do, I would end up cutting off my thumb or something like that. 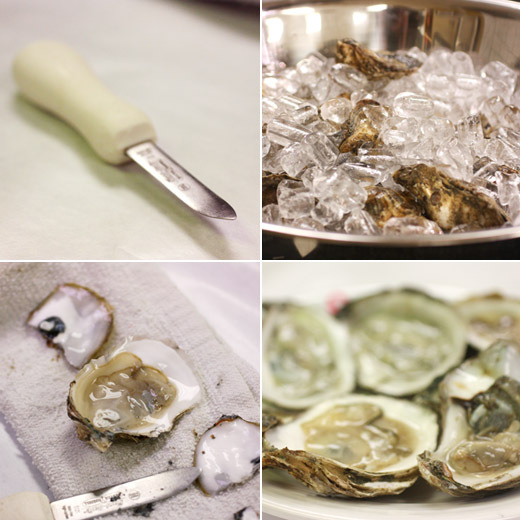 Last week, I had my chance at the oyster class at Central Market Cooking School which I attended with a media pass. 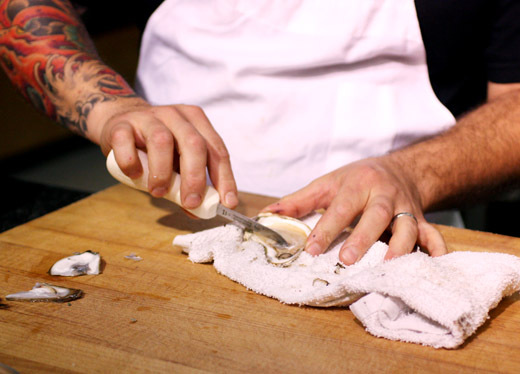 The class, taught by Scot Loranc, started with a lesson on shucking. We watched, learned, and then experimented. Scott explained his preference for a dull oyster knife with a slight bend at the tip of the blade. The bend makes it easier to get the knife into the hinge in the oyster shell, and it makes it less likely that you will hurt yourself if the blade slips. The oysters had already been scrubbed and placed on ice. A nice, cold oyster will be more relaxed and possibly easier to open. We each set an oyster on a folded towel with the cupped side of the oyster down and the flat side facing up. We each held our oyster in place and protected our hand with the towel. Then, it was time to pry open the shell. As the blade broke the hinge, Scot said to twist the knife "like you're riding a motorcycle." And, just like that, I learned to shuck an oyster with no damage whatsoever to my thumb. The class attendees got some good practice while shucking several oysters, and then we enjoyed the fruits of our labor. By tasting the four different varieties we shucked raw and plain, side-by-side, the differences in taste and texture were clear. We learned that oysters from warmer waters tend to be saltier, and some have more body or heaviness than others. My favorite variety of the night was the Malpeque oysters from Canada. After shucking and tasting, it was time to cook. First, we prepared a baked, scalloped oyster dish served in ramekins. 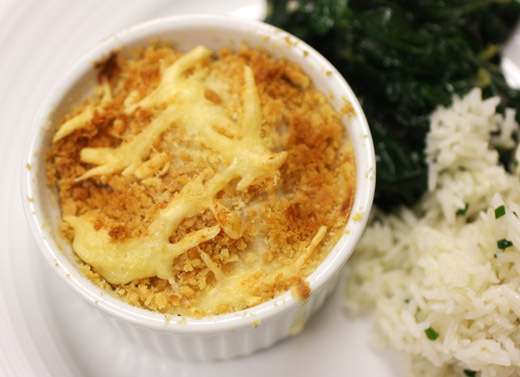 We whipped up a Mornay sauce with Gruyere which was layered in each ramekin with raw oysters, cracker crumbs, and more shredded cheese on top before being baked. The dishes emerged browned on top and bubbly. This would be a great spring brunch dish, and it could be tweaked in all kinds of ways like by adding asparagus tips or other types of shellfish. 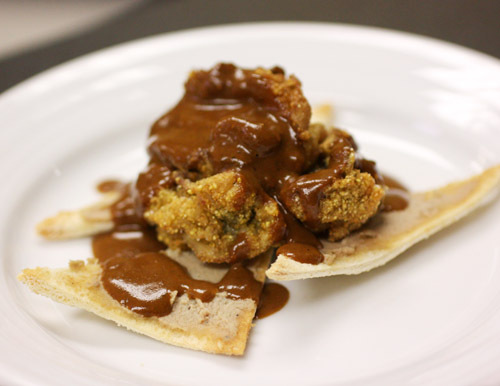 Next on the menu was Oysters Foch which is a classic dish from Antoine's in New Orleans. Needless to say, it's a rich dish with a serious sauce. It's called Colbert sauce which is a combination of two other sauces. First, a Hollandaise was made, and Chef Scot showed us his preferred technique for it. Rather than setting up a double-boiler, he whisks the egg yolks and lemon juice in a stainless steel bowl while repeatedly moving the bowl onto and then off of a burner with a low flame. Once it started to thicken, melted butter was slowly added while continuing to move the bowl on and off the heat. It's a quicker method than using a double-boiler, but you have to be sure the eggs don't get too hot at any point. The finished Hollandaise was added to a French-Creole tomato sauce that had been thickened with a roux, and sherry was added to the combined sauces. The last ingredient is one that, honestly, I would skip. Antoine's prefers to add some caramel coloring to deepen the brown of the sauce. The completed Colbert sauce was kept warm while oysters were fried and toast points were schmeared with pate. 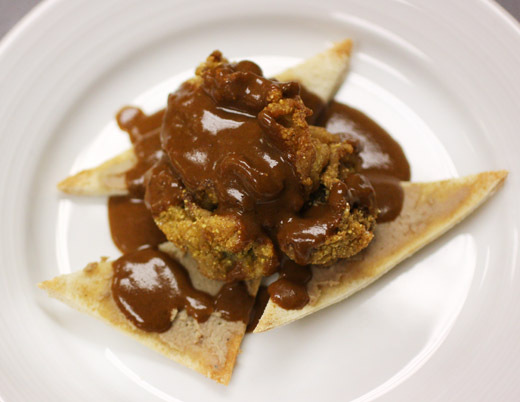 The dish was presented with the toast with pate topped with fried oysters and the sauce drizzled over them. It was a decadent taste of New Orleans to end the night. I left the class with a new appreciation for the folks who prep those clean and lovely-looking, perfectly shucked oysters on the half shell at restaurants and bars, but I also now have less fear of prepping a few for myself from time to time. 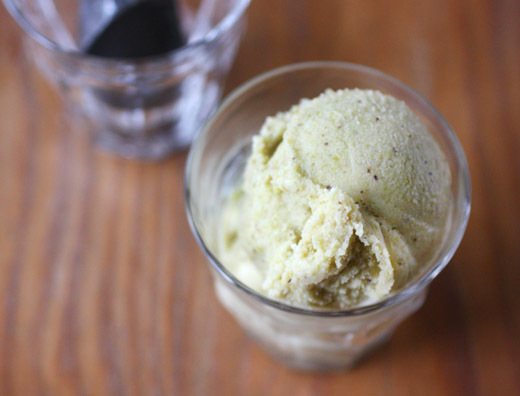 I wasn't lying when I said I'd be making pistachio gelato soon. Now, I'm thinking I need a bigger ice cream maker because frozen treats like this one never seem to last long. The recipe is from the book The Country Cooking of Italy , and true to traditional gelato-making, it’s lower in butterfat and sugar than ice cream. In the book, there’s a brief story about the arrival of sorbets and gelatos in Italy and a mention of ice cream sandwiches. It was in Sicily where gelato was first scooped into a brioche roll and was typically eaten that way in the morning. Why have I never had gelato in brioche for breakfast, and how soon can I change that? In describing gelato, Andrews writes: “(it) has a distinctive texture, creamy but sometimes faintly grainy.” With this pistachio gelato, that was definitely true. It’s made with pistachio flour which I could have ordered online, but instead, I ground whole pistachios in a food processor. I sifted the ground pistachios, but I suspect a purchased pistachio flour would have been a little finer. So, yes, my pistachio gelato was slightly grainy, but what struck me most about it was how rich and creamy tasting it was considering that there were no eggs and no cream. 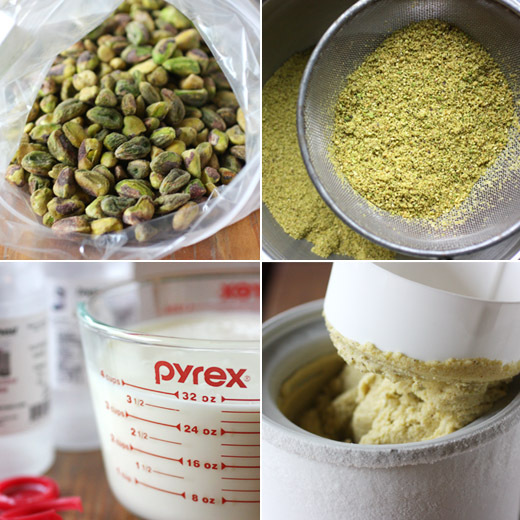 If you’re able to find pistachio flour, then by all means, use it. But, grinding pistachios in a food processor is an easy task. As I mentioned, I sifted the ground pistachios before using them. One cup of the sifted ground pistachios was used, and that was placed in a big measuring pitcher and set aside. This particular gelato was thickened with corn starch. So, cornstarch and sugar were placed in a heat-proof bowl with some milk, and the mixture was whisked to combine. More milk was heated to a simmer in a saucepan, and the cornstarch mixture was whisked into it. That mixture was heated, while stirring, until it thickened which took about ten minutes. The thickened milk mixture was then poured over the ground pistachios while whisking. This was left to cool and then refrigerated overnight. The next morning, the pistachio mixture was poured through a sieve before being poured into the ice cream maker. The flavor was completely pistachio, and I loved that plenty of green remained in the mixture after straining out the ground nuts. This does freeze very firm, so it’s best to move it from the freezer to the refrigerator about an hour before you plan to scoop it. Then, it’s surprisingly velvety and rich-tasting for what a simple concoction it is. Before I even begin to tell you about this sandwich, I’m going to suggest you stop what you’re doing, go directly to the nearest kitchen, and whip up a bowl of homemade miso mayonnaise. I wish someone would have given me this advice whenever this recipe was first invented because when I made it last weekend, I immediately felt all those years spent eating other mayonnaises had been squandered. If you’re someone who likes mayonnaise, then you probably already know the wonders of a homemade version. Now, imagine how good that homemade mayonnaise is, and then imagine it even better as if it’s been given a flavor boost. That’s miso mayo. 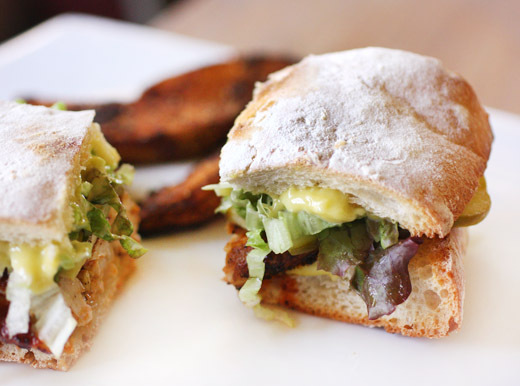 This mayonnaise and the sandwich were in the second issue of Lucky Peach . 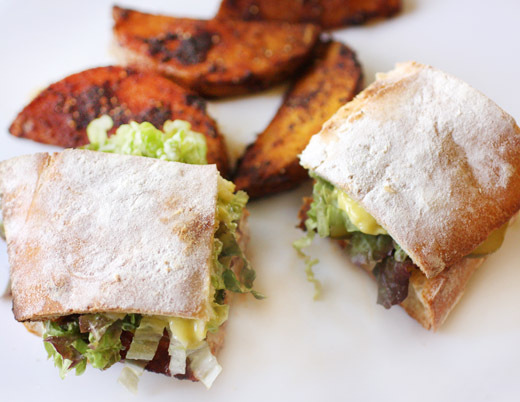 In the magazine, the sandwich was made with bluefish, but I used Texas redfish. Really, there’s so much going on with flavors from the aforementioned, amazing mayonnaise and the blackening spice, just about any fish or tofu or even blackened bread would make a terrific sandwich here. I cheated in a couple ways in making this. I skipped the recipe for the homemade bread-and-butter pickles for the sandwich. It didn’t seem worth doing since cucumbers aren’t in season right now, and I have a preference for sour dill pickles with no sign of sweetness anyway. So, I used dill pickles from a jar. Next, I cheated with the blackening spice mix. I somehow blanked on the ground konbu in the ingredient list and didn’t even know I should have looked for it at the grocery store. Also, I miscalculated how little mustard seed I had on hand and failed to buy more for this. Oddly enough, I did, however, have the grains of paradise, whole allspice, and tomato powder, along with all the other ingredients, in my spice cabinet. Next time I make this, I will try to get the konbu for the umami it would have added to the mix. In general though, with so many different spices involved, if you add more of one item, less of another, or need to skip something, you’ll still have a great spice mix. The full list of everything in the blackening spice is: three tablespoons grains of paradise, and I’ve gone on about grains of paradise once before, two teaspoons black peppercorns, one teaspoon coriander seed, four tablespoons mustard seed, one teaspoon cumin seed, one teaspoon whole allspice, one quarter cup ground konbu, three tablespoons onion powder, two tablespoons cayenne powder, one quarter cup tomato powder, and one half cup sweet smoked paprika. Note: in the magazine, the quantity for cayenne powder is six tablespoons, and I think that must have been a typo. I like things spicy, but that seemed like an extraordinary amount of cayenne. I used two tablespoons and tasted to see if I wanted it spicier. Two tablespoons gave it a good amount of heat even to my palate. The whole spices were toasted in a dry skillet, and then ground and mixed with the powdered spices. Fish fillets were seasoned with salt, dredged with the blackening spice, and seared in a hot pan with a little oil. 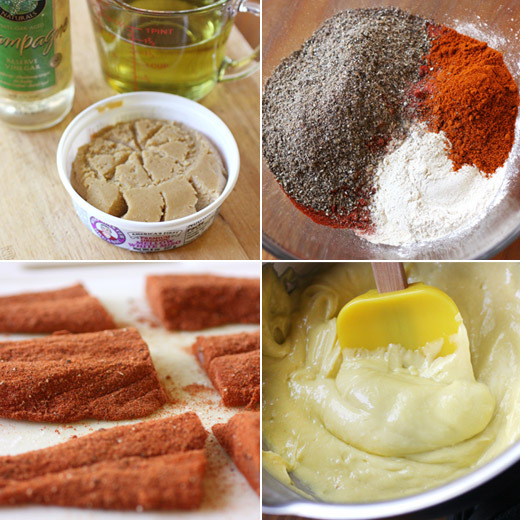 The blackening spice was also used on some oven fries. Again, I cheated. In the magazine, the blackened potato chips were to have been fried. Now, for that amazing mayonnaise, you make a typical homemade mayonnaise and add one tablespoon of champagne vinegar and two tablespoons of white miso. I don’t seem to have the gene that allows one to make a mayonnaise with one egg yolk. Mine always breaks when I start with just one yolk, and I always start over with another yolk and mix the broken oil mixture into the second yolk. I also seem to have better luck with a hand mixer than with a food processor or blender. I’ve used a whisk as well, but a hand mixer is easier. The sandwich was built with toasted and buttered bread, shredded lettuce, sliced pickles, the blackened fish, and the wonder that is miso mayo. The spice mix does exactly what it’s intended to do once it hits the hot oil in the pan. It blackens as quickly as the fish cooks, and that deepens the flavors of the spices. It was just as delicious on the oven fries, and the extra miso mayo makes a great dipping sauce for them. My mind is already swirling with thoughts of other ways to use that mayonnaise. Using what's locally grown and of the season while adding lots of interest with spices from around the world is a way of cooking that appeals to me. In his new book Masala Farm of which I received a review copy, Suvir Saran's cooking style is just that. He looks to add masala, "a combination of ups and downs, bitterness, spice, and sweetness," to every day. He and his partner, Charlie Burd, bought a farm in upstate New York where they raise several breeds of chickens, goats, sheep, geese, and ducks, and here, the meals they prepare are inspired by the time of year, what's available, and what's possible on a given day on the farm. There are charming stories about their animals, how they chose them, and how they care for them. And, there are stories about other farms in the area and the locally produced goods available at different times of year. The book takes you through each season with the food and fun from the farm. Some dishes are simple, farmhouse favorites like Cauliflower, Chevre, and Onion Quiche, Rhubarb and Raspberry Cobbler with Creme Fraiche Cream, and Summer Tomato Pie. And, then others are given a twist with added spices like the Sweet and Sour Butternut Squash, Garam Masala Roast Chicken, and Deviled Eggs with Cilantro, Chiles, and Spices. Indian favorites are included too with Bread Pakoras, Peanut Chaat, Farmhouse Chai, and Birbal Kee Khitcheree. Let me tell you a little about me and Indian food. I love it, but in the past, I was never able to cook it. The few attempts I made resulted in disaster. That was mostly my own fault for probably rushing the process or not being prepared for what I was attempting to make. However, I would like to also lay a little blame on the inability to ever find all the ingredients needed in this town. I can never find fresh curry leaves, in the past I always had to skip at least a few spices when they weren't available locally, and I can't always find the right type of dal for a dish. I was feeling ready for a challenge though, and I really wanted to try making the Khitcheree from the book. I set aside an afternoon to do an ingredient hunt. Thanks to our Savory Spice Shop, I found all the spices needed for this, and they even have dried curry leaves. The only item I wasn't able to locate was split and hulled mung beans. I used yellow split peas instead. 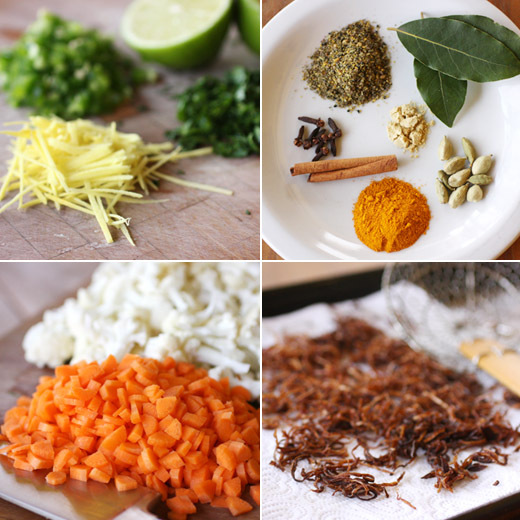 This dish involves making a topping of cilantro, ginger, chiles, and lime juice, frying onions for an additional topping, making the spice mix Panch Phoran, cooking the khitcheree itself, and preparing two tempering oils that are added at the end. There were several places where I could have ruined this, but I didn't. And, it was worth every single step. At last, my run of failed Indian dishes has ended. 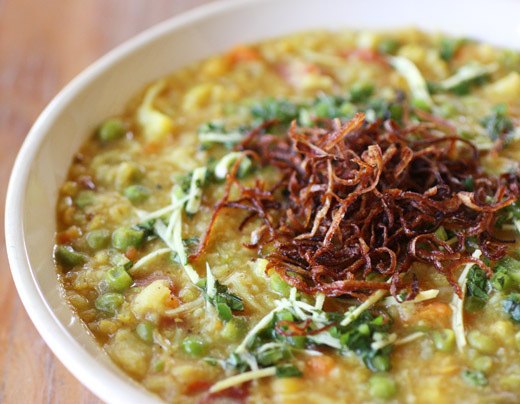 This is soothing comfort food with the rice, lentils or split peas, and vegetables cooked together, but the flavors also surprise your palate with heat, spice, warmth, freshness, and acidity. Next, I want to try the Farro and Mushroom Burgers with Tomato-Onion-Peanut Chutney, the Shrimp and Sweet Corn Curry, Almost-Flourless Caramel-Lacquered Chocolate-Peanut Torte, and whatever else might add a little masala to my day. When craving comfort food, I most often dream of khitcheree. The vegetarian one-pot meal of lentils, rice, and vegetables is transported to another dimension via multiple layers of spices—every bite is a new discovery of tastes and textures. The dish includes Panch Phoran, a spice blend of whole cumin, fennel, and the wonderfully exotic, nutty flavor of nigella seeds that are gently fried in ghee or clarified butter with coriander and tomatoes, and then a second boost of spice from a ghee-bloomed blend of more cumin, some cayenne, and oniony asafetida. It is such an incredible dish that there is even a legend behind it: Hundreds of years ago in mid-fourteenth-century India, Birbal, a court official of Emperor Akbar, made a khitcheree that was so enchanting, the emperor decided to make Birbal a Raja king! At our house, we like to say that if it’s good enough for Akbar and Birbal, it’s good enough for you. This dish is so lovely that I often just serve it with nothing else except for some Raita and perhaps crispy papadum on the side. Make the recipe a few times and then begin to play with the flavors and simplify it as you like. I promise you won’t be disappointed. In a small bowl stir together the cilantro, ginger, jalapeño, and lime juice together and set aside. 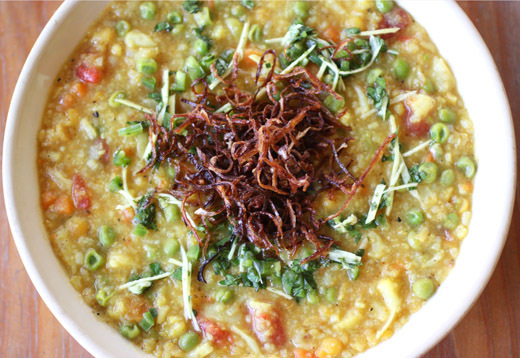 Place the mung dal in a large frying pan over medium heat and toast it until fragrant and lightly golden, 3 to 5 minutes. Transfer the dal to a large plate and set aside. Place the ghee, cardamom, cloves, bay leaves, cinnamon, panch phoran, turmeric, and asafetida into the same pan and roast over medium heat until the spices are fragrant, about 2 minutes. Add the rice, toasted dal, cauliflower, potato, and carrots, and cook until the rice becomes translucent and the cauliflower sweats, 3 to 5 minutes, stirring often. Pour in the 7 cups/1.65 L of water, increase the heat to high, and bring to a boil. Add the peas, bring back to a boil, reduce the heat to medium-low, cover, and simmer for 20 minutes. Heat the ghee and panch phoran in a large frying pan over medium heat until the cumin in the panch phoran begins to brown, 2 to 3 minutes. Stir in the onion and salt, and cook until the onion is browned around the edges and soft, about 10 minutes. If the onion begins to get too dark or sticks to the bottom of the pan, splash the pan with a bit of water and scrape up the browned bits. Stir in the ground coriander and cook, stirring, for 2 minutes. Stir in the tomatoes and the cayenne and cook until the tomatoes are jammy, 6 to 8 minutes, stirring occasionally. Turn off the heat and set aside. Once the rice and dal are cooked, remove the lid and use a potato masher to smash the mixture until only a few carrots and peas remain whole (remove the whole or large spices while mashing if you like). Stir in the first tempering oil along with the 3 cups/750 ml water. Return to boil and cook for 2 minutes. Turn off the heat. To make the second tempering oil: Wipe out the pan from the first tempering oil and heat the ghee for the second tempering oil over medium heat. Add the cumin seeds, cayenne, and asafetida, and cook, stirring often, until the cumin begins to brown, about 2 minutes. Immediately stir it into the rice and dal mixture. Divide the khitcheree among 6 bowls; top with some of the ginger mixture, a pinch of garam masala, and the fried onions; and serve. This is a whole-spice blend that is similar to garam masala, except that panch phoran adds texture as well as flavor. While it is most often used whole, panch phoran can be pulverized in a spice grinder or by using a mortar and pestle and added to curries like the Shrimp and Sweet Corn Curry. Mix together and store in an airtight container for up to 1 year. Makes 5 tbsp/25 g.
Garam masala is perhaps the most well-known Indian spice blend (aside from curry powder). It’s a northern spice, used in places like New Delhi and the Northern Plains, where the winters are harsh. The spices used in this mix – cinnamon, cloves, and chiles – have a warming effect, making the addition of garam masala to recipes not just delicious but useful too. Heat the cinnamon, bay leaves, cumin seeds, coriander seeds, cardamom, peppercorns, cloves, and chile in a medium frying pan over medium-high heat, stirring often, until the cumin becomes brown, 2 1/2 to 3 minutes. Transfer the spices to a baking sheet to cool. Once cooled, transfer the spices to a spice grinder, coffee mill, or small food processor, add the nutmeg and mace, and grind to a fine powder. Store in an airtight container for up to 4 months. I have no idea how an entire year went by during which I watched so few current films. As of Oscar night, I had seen exactly two of the movies nominated for Best Picture. As usual, we attended an Oscar party and bet on the outcome of the awards. I was sure the Academy would pick George Clooney as Best Actor, and in my typical Oscar-betting fashion, I was wrong. At least I had these cookies to enjoy during the ceremony. They’re little squares of pastry that get folded over a filling of brownie dough and end up looking a little like bow ties. I thought bow tie cookies seemed appropriate for Oscar night. The recipe is from Chewy Gooey Crispy Crunchy Melt-in-Your-Mouth Cookies , and I have a couple of things to tell you about making these cookies. First, Alice Medrich is always very precise with her instructions, so rolling the pastry dough and cutting it to the size she suggests works well. She then instructs you to fill each pastry square with one rounded teaspoon of brownie dough and fold two corners of the square in and seal at the top with water. Maybe I rounded my teaspoons of brownie dough too much because the first batch I placed in the oven came out looking like they sort of exploded and not much like bow ties. So, less than you think of the brownie filling per cookie is better. The other thing I wanted to mention is that Medrich suggests optionally grating some cinnamon stick or nutmeg over the cookies before serving. I suggest definitely doing so. I used both cinnamon and nutmeg. When I tasted a cookie that hadn’t been dusted with the spices, it was of course delicious, but it seemed lacking or naked compared to the ones with spices. You begin by making a cream cheese rugelach dough which needs to be refrigerated for at least a couple of hours before being rolled out. Next, you make the brownie dough by melting butter and chocolate in a double-boiler. Some sugar is added to the butter and chocolate followed by vanilla, salt, and eggs. 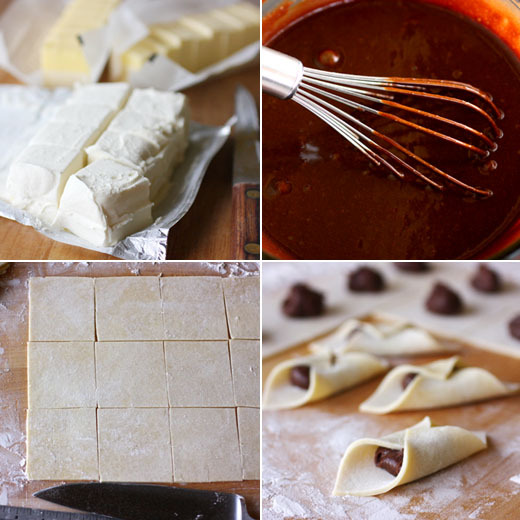 A little flour is whisked in, and then this chocolate dough is also refrigerated for at least an hour or overnight. I made both doughs a day in advance of rolling, cutting, and filling. Working with one quarter of the rugelach dough at a time, it is rolled out and trimmed into a nine inch by eleven inch rectangle which is then cut into twelve squares. A barely rounded teaspoon of the chilled brownie dough should be placed in the center of each pastry square. Then, two opposite corners are pulled up and over the brownie dough, and the pastry corners are pinched with water to secure. Just before going into the oven, the cookies are brushed with milk and sprinkled with sugar, and they are baked for about 20 minutes. After cooling, I highly recommend grating cinnamon and nutmeg over the cookies. These aren’t the quickest cookies to bake, but all of the steps involved are simple enough. 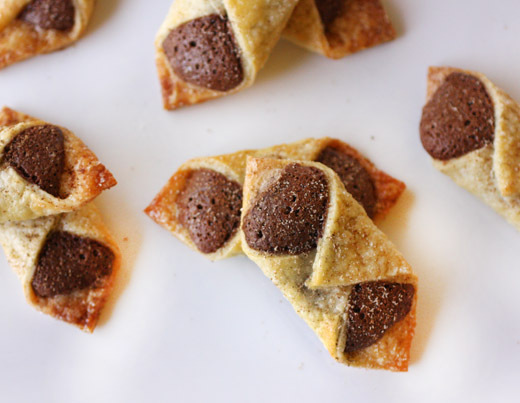 The cream cheese pastry is delightfully flaky, rich, and tender for a cookie, and it makes a very nice wrapper for a bite of dark chocolate brownie. 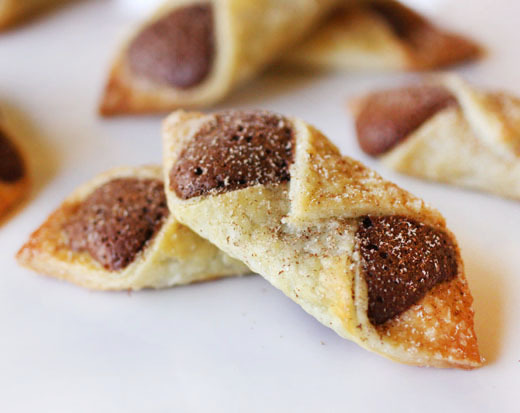 They’re dressy, little cookies suited for a black tie kind of night. My family tells me I’m mostly Irish, and if that’s true, then I must have lived a former life in an Italian village. Italian food, olive oils, cheeses, and wines speak to me like no others. It was a delight to read the new book from Colman Andrews, The Country Cooking of Italy, of which I received a review copy. Of course, it’s a terrific book having been written by Colman Andrews with photographs by Christopher Hirsheimer and Melissa Hamilton. It is true to its title in that the recipes aren’t necessarily all the most obvious Italian dishes; although, there are several well-known favorites. Instead, it’s a collection of food found outside the main cities. It covers dishes found in every corner of the country including Sicily and Sardinia. There are a few dishes in the book that I know well and make frequently like Broccoli Rabe with Olive Oil and Sea Salt and Spaghetti al Pesto Trapanese. But, there are also some less well-known dishes like Spaghetti alla Callabrese made with ginger and mint, Scapece di Vasto which is like an escabeche of swordfish from the town of Vasto on the Adriatic coast, and a Sardinian Flatbread “Lasagna” made with pane carasau topped with poached eggs. There are soups for all seasons, antipasto, fresh and dried pasta dishes, flatbreads and tortas, poultry, meats, game, offal, salads and vegetables, and desserts. All of the recipes are woven together with stories about ingredients and their origin or arrival in Italy, various food festivals, tidbits about several of Andrews’ visits to different areas of the country, other writers’ observations on traveling in Italy, and more. From the Salads and Vegetables chapter, I was reminded of the great combination of fennel, orange, and onion, and I made that salad right away while blood oranges are still in season. A couple of pages later, I learned that black-eyed peas had been popular in Italy for at least a hundred years before they were grown in the southern US, and in Italian, they’re called fagioli con l’occhio. In Tuscany, they’re served simply dressed with olive oil. Next, I jumped to the Desserts and Confections chapter and tried the Limoncello Sorbetto. It’s a lovely, tart, icy, and light dessert. This is something I’ll be making often. While the sorbetto spent time in the freezer, I turned back to the Rice and Polenta chapter for the Polenta with Gorgonzola which is a dish Andrews remembers from a spot in Verona. It’s as easy to prepare as it sounds. 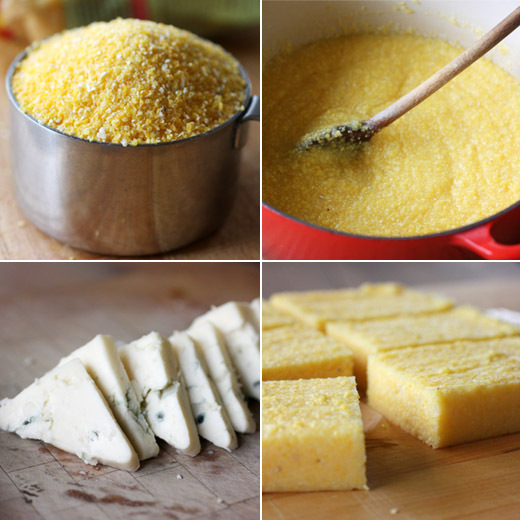 A recipe of Basic Polenta was made and left to set up in a square pan. I made it the day before I planned to serve it and left it in the refrigerator overnight. 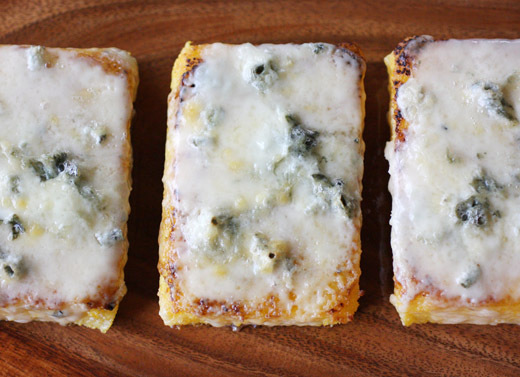 Once set, big rectangles of polenta were cut, and they were seared in a hot pan before being placed on a baking sheet and topped with slices of gorgonzola. The cheese-topped polenta rectangles then went under the broiler for a few minutes until the cheese melted and bubbled. Searing the polenta pieces gave them a toasted flavor and made the edges crisp. And, while you could use any cheese you prefer, the big flavor of gorgonzola was a great contrast to the mild polenta. I think I enjoyed the anecdotes and information as much as the food in this book. And, I know I’ll be pulling it off the shelf often for reminders about some classic dishes and to try some of the ones that were unfamiliar to me. 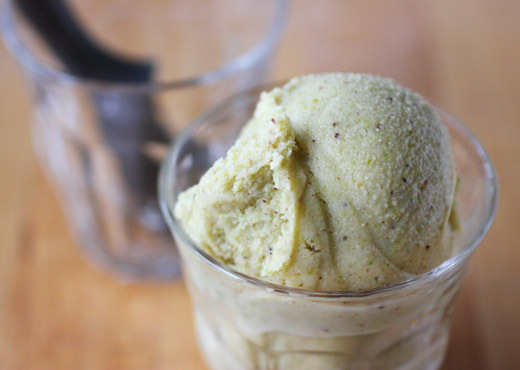 I’m already planning on making the Pistachio Gelato as soon as the sorbetto is gone, and when spring and summer vegetables start appearing, I can flip to several other pages that are also marked. When I was writing regularly about wine, I used to make an annual pilgrimage to Verona to attend Vinitaly, the massive international wine trade show. Almost every night during my stay, if there wasn’t an organized banquet somewhere that I had to attend, I would end up (along with many of my colleagues) at a place called Antica Bottega del Vino, on a little side street in the middle of town. (It is said that a century ago, there were literally hundreds of such places in the city.) As its name suggests, wine is the specialty; every available surface seems to be crowded with bottles—supposedly one hundred thousand of them in all—and scores of good wines are available by the glass. I rarely had a complete dinner (I had usually been snacking all day), but one dish I always looked forward to, sitting at a little wooden table out in the front part of the place, was a big slab of slightly charred fried polenta topped generously with just-melting gorgonzola. This is approximately how it was made. -Cut the polenta into 4 to 6 rectangles, each about 3 by 5 inches/7.5 by 12.5 centimeters. -Brush the rectangles well with oil. Lightly grease a shallow, flameproof baking pan or dish large enough to hold the polenta rectangles in a single layer and set aside. -Lightly grease a large grill pan (preferably) or cast-iron frying pan and heat over high heat until very hot. Working in batches if necessary, sear the polenta rectangles, turning once, until crisp and slightly charred on both sides, 2 to 3 minutes per side. 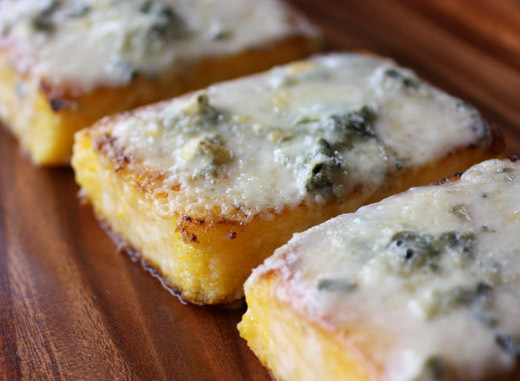 As the polenta pieces are done, transfer them to the prepared baking pan, and immediately cover each slice generously with slices of gorgonzola so the cheese begins to melt from the heat of the polenta. -When all the slices are cooked and covered with gorgonzola, put the baking pan under the broiler until the cheese turns golden, 1 to 2 minutes. Serve immediately. There’s a lot of conflicting advice out there about how to cook polenta. The water should be boiling, or maybe simmering, or, no, at room temperature. The cornmeal should be added in a thin stream, or just poured steadily from a bowl. The polenta should be stirred constantly for an hour, or maybe an hour and a half . . . unless of course twenty minutes is sufficient. Or, hey, just forget about all that work and buy instant polenta. In the dozen years or so that I was at Saveur, the test kitchen must have made polenta thirty or forty times, using every different method imaginable. This technique, which is basically Marcella Hazan’s, gave the best results for the least amount of work—but it is still reasonably labor-intensive. -Put 61/2 cups/1.5 liters water into a large, heavy-bottomed pot and bring to a boil over high heat. Stir in 1 tablespoon salt and reduce the heat to medium-low. When the water slows to a simmer, start adding the polenta in a very slow, steady stream, stirring it constantly with a long, strong wooden spoon. (“The stream of cornmeal must be so thin that you can see the individual grains,” counsels Hazan. “A good way to do it is to let a fistful of cornmeal run through nearly closed fingers.”) Continue adding the polenta and stirring until it is used up and then stir the polenta until it is thick and beginning to pull away from the sides of the pan, about 20 minutes. -Serve the polenta immediately, or pour it out onto a wooden board or platter to cool for later use, shaping it into a rectangle about 1 inch/2.5 centimeters thick as it cools if you are going to fry it later.